4The Community Concerns Board works to serve St. Luke’s local community, especially our Parkway neighborhood. To show God’s love to those around us, we try to identify the area’s most pressing needs and then meet them in practical, effective ways. Our children’s clothing closet supplies clothes, jackets, and shoes for sizes newborn to young adults. Our community has a real shortage of adequate children’s clothing for all seasons, and this program is a simple way to provide what’s needed. This service is completely free. If your children could use some clothes in good condition, you’re welcome to pick out whatever you like. Optionally, you can make an exchange for your children’s worn-out or outgrown clothes – they’ll be put to good use! The closet is open Monday through Thursday from 9:00 am to noon. If you need an appointment outside of these hours, contact the church office at 916-421-5039 to schedule one. In partnership with other local churches, we provide new shoes for needy children of Charles Mack Elementary School. 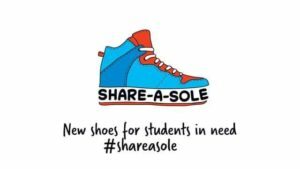 All shoes will be delivered and personally fitted to the students October 10, 2018. We will host a community-friendly Trunk-or-Treat afternoon for kids of all ages to come and have fun! Come join in the games, lots of trunks holding treats, cupcake walk, pumpkin patch, face-painting, food, and the children’s clothing closet will be open to all who need it. We’ll start with a costume parade with prizes for the best costume for children and adults. There will be a Kids Coat Giveaway too. Join us for the fun October 27, 2018 from 2:00 – 5:00 pm and don’t forget to bring your own goodie sack to fill with treats. We meet the community’s needs is by offering St. Luke’s facilities as a meeting place for local organizations, like the Girl’s Scouts and other Anonymous support groups. We collect women’s and children’s clothes for St. John’s Shelter for Real Change, an emergency 24-hour shelter that supports homeless women and their children, giving them a place to stay and helping them transition from crisis to self-sufficiency. We collect women’s clothes and baby diapers to support Chicks in Crisis, an organization that helps homeless women and women facing unwanted pregnancies. Together with W-ELCA, we collect school supplies to provide backpacks filled with supplies for two local schools, Parkway Elementary School and Charles Mack Elementary School. We also collect non-perishable foods to support two local food banks, the Elk Grove Food Bank and the South Sacramento Interfaith Partnership. If you want to donate clothes, diapers, personal hygiene supplies, or nonperishable foods, drop them off in the foyer any Sunday! Together with other local churches, we offer a Winter Sanctuary for the homeless; we give them a hot meal and a warm place to sleep for a night. This program also connects homeless persons with social services that can help them transition from the streets.